There are 23 blog entries for January 2015. Friday, January 30th, 2015 at 8:49am. The stresses of getting your loan approved, the overwhelming online searches looking through list after list of homes, the excitement of finding your perfect home, the nail-biting of waiting for your offer to be accepted—all of these things can make for a stress-filled emotional ride.If you take a moment and plan ahead, however, you can incorporate some organizational tips into searching for your new home so that you don’t feel overwhelmed on a daily basis. Thursday, January 29th, 2015 at 8:22am. and an amazing back yard. open kitchen – perfect for preparing family meals. or when you have friendly get together. Wednesday, January 28th, 2015 at 9:09am. Good Bull BBQ Cook-off and Vendor Fair is a free and exciting fundraiser that will be hosted by the Friends of Brazos Valley Heroes, Inc., a non-profit organization that honors heroes through fundraising and donations. The Cook-Off proceeds will benefit local Brazos Valley veterans and emergency responders. · Open Margarita Competition, shaken or stirred! Tuesday, January 27th, 2015 at 2:53pm. If you don't move it, you'll lose it. Staying active keeps our joints limber, our bodies healthy and our minds clear. This is especially important as we get older. The City of College Station believes this to be true as well. That is why they are hosting the 2015 Brazos Valley Senior Games from February 19-22. Senior games in the past were limited to those residents ages 50 and older. However, for the 2015 Brazos Valley Senior Games, the Parks & Rec Dept is allowing a "Kids Division"
New Listing! Charming Plus Individuality! Monday, January 26th, 2015 at 9:01am. Monday, January 26th, 2015 at 8:52am. Are you and your family looking to buy a new home? Before any action is taken, you must begin taking inventory of the needs for you and your family in making your next home choice. Being specific with your desires is a must. Preparing a checklist for yourself is always a great start. It’s important that you and your family note what amenities may make or break a deal. Friday, January 23rd, 2015 at 9:22am. When it came to cleaning my room, my mother always told me to clean it as if the Queen of England was stopping by. The same goes for selling your home. Treat your potential home buyers like royalty and make sure your home has been deep cleaned from top to bottom. Thursday, January 22nd, 2015 at 4:02pm. Shinning with many updates, this impeccably well-loved home offers an impressive Texas sized lot! Situated on just under half an acre of expansive tree shaded yard space lends ample room for parking, entertainment, & play time. A worry free condition with both a clean & comfortable atmosphere highlighted by attractive features such as granite counters, stainless steel appliances, newer paint & carpet, high efficiency HVAC, wood burning brick fireplace, French doors, 2 relaxing covered patio areas & more. Flexible study could be used as an extra bedroom for accommodating additional roommates. Excellent location for that quick trip to A&M Campus. Sneak a peek today! Wednesday, January 21st, 2015 at 8:14am. With the holiday season at our finger-tips, decorating is a common seasonal tradition that reminds us of first appearances when walking into the front doors of our relatives and close friend’s homes. Front doors especially highlight a sense of style and mood to your home, which is why decorating them has become so popular. Whether it’s decorating, replacing, or lighting up your front door, it is indeed a part of the holiday spirit. Tuesday, January 20th, 2015 at 4:05pm. Reading is an important building block in a child's education. Approximately 36 million American adults only read at a 3rd grade level or below. That should be a crime. Do not let this happen with your children. 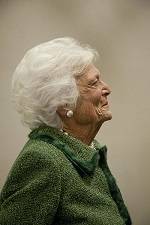 If they are in grades three through eight and live in the College Station community, they are invited to join in with other students across the country as Barbara Bush reads to College Station students.